From above, forests unroll like thick carpets of maple or pine. Beneath the leafy canopy, however, one might find ginseng root, mushrooms, blueberries, hazelnuts, floral greenery, or even ducks. For millennia, indigenous cultures thrived on sustainable tree-based agriculture, and today, mainstream Americans are embracing the tradition through forest farming. In their book Farming the Woods, Ken Mudge ’80 PhD and Steve Gabriel offer a detailed look at multilayered, multipurpose forest production. A Cornell University professor specializing in agroforestry, Mudge says that healthy forests can produce a valuable range of food, medicinal, and other non-timber products. Coffee and chocolate, for example, are grown under the protective cover of tropical rainforests. Shade-loving ginseng root—selling for up to $600 per pound—is grown in U.S. forests, as are shiitake mushrooms, which are often cultivated on logs. 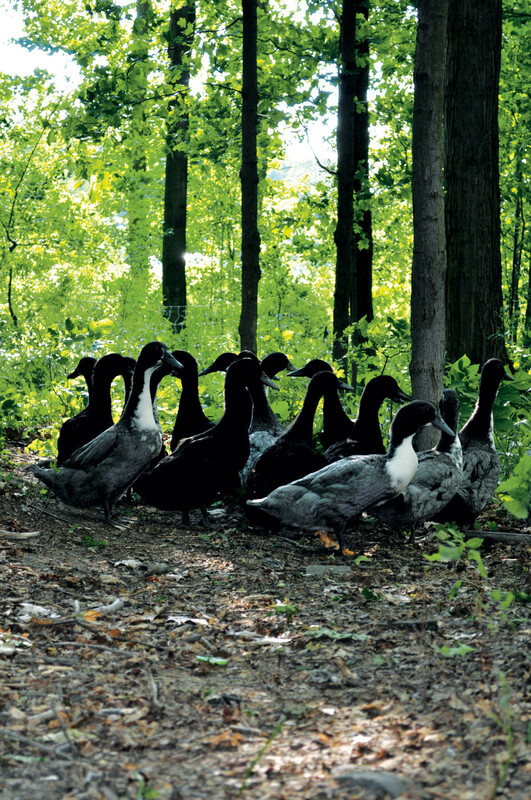 Forest farming is also a form of protective conservation, says Mudge, providing erosion control, nutrient recycling, shade, clean air and water, and wildlife habitat. Additionally, trees help buffer extreme temperature and weather events, an important consideration for forest management in the face of climate change. Although Farming the Woods focuses on harvesting edibles like native pawpaw fruit and maple syrup from deciduous forests in upstate New York, the principles easily reach across the nation to the evergreens of the Pacific Northwest. In Olympia, Washington State University Extension agent Jim Freed develops agroforestry practices with indigenous people around the world. He originally came to Washington to work with Christmas trees. “I got lots of questions about what people could do with their land besides watch the trees grow,” he says. Native fruits and nuts are also in demand. “With wild blackberries, raspberries, and blueberries, we don’t need sprays, we just manage the overstory,” says Freed. He is currently developing local markets for pine nuts. Learn how to grow oyster mushrooms on rolls of toilet paper, or buy mushroom growing kits.